Have a nutrition-related question? We’re happy to help. Use the form below to ask your question and get an answer from a registered dietitian nutritionist! To read answers to other questions, scroll down. Sign me up to receive nutrition tips, recipes, and more from Houston Family Nutrition. Is it OK to eat cheese? Yes, cheese is in the dairy group and provides calcium, protein, B12, phosphorus, magnesium, zinc and vitamin A, not to mention satisfying flavor and fat that can quell hunger. Can cheat meals be part of a healthy lifestyle? Absolutely. The concept of a cheat meal is great because it allows people to plan for an indulgence, and fit it into an otherwise healthy diet. This way, if a temptation arises, on say, Sunday, but someone has planned a cheat meal for Tuesday night, it helps them say, no, I’ll pass, because I know I am going to be eating x,y, and z on Tuesday. That can be all the difference in sticking to a nutrition plan! How can diet improve mental health? Diet and exercise ABSOLUTELY impact mental health. Decreasing junk food and increasing B vitamins, Omega 3’s, fiber, and antioxidants like vitamin E from plant based foods, nuts, and fish make a big difference in depression, anxiety, age related cognitive decline, and helps delay the onset of Alzheimers and Dementia. Exercise is well studied to do the same things, as well as increasing the feel-good hormones. Exercise and good nutrition promote healthy blood flow through the brain, which helps protects from stroke. Healthy diet and exercise have even been shown to enhance the shape and structure of our brain over time, promoting enhanced health and function. Both the Mediterranean and DASH diets are nutrition plans that promote whole grains, plenty of plant-based nutrients and limit alcohol, sweets, and processed foods. In addition, these diet patterns promote physical activity and plenty of sleep as part of an overall healthy lifestyle. I have hypothyroidism. Is there a special diet I should follow? Hypothyroidism describes a condition in which the body is not producing enough of the thyroid hormones, T3 and T4, due to an under-active thyroid. Thyroid hormones are necessary to regulate certain bodily functions, such as body temperature, tissue growth, and metabolic rate. Inadequate levels of these hormones can cause the body to slow down, causing symptoms of fatigue, weight gain, and constipation. Hypothyroidism can have a variety of contributors to its development and treatment may vary depending on the underlying cause. The priority for individuals with hypothyroidism is monitoring labs and medication in order to establish and maintain control of the disease. There is no specific diet that can cure hypothyroidism, but there are there are important nutrient considerations of hypothyroidism management. Individuals who are experiencing weight gain or have trouble losing weight may benefit from a calorie-controlled diet. In addition, there are important nutrient considerations in hypothyroidism management. The main nutrient that promotes thyroid hormone synthesis is iodine. Many individuals with hypothyroidism have an iodine deficiency. The body cannot produce iodine on its own, so it is necessary to obtain it from our diet. The recommended iodine consumption for a normal adult is 150 mcg/day and since iodine is degraded by the body, consistent intake is important to maintain appropriate levels. Including iodine-rich foods in the diet may be beneficial in suppressing symptoms: dairy products (cheese, cow’s milk, yogurt), iodized salt (you can find this in almost every grocery store), eggs, seafood (saltwater fish and shellfish), or even trying a multivitamin that contains iodine. Hormone replacement therapy is a common treatment option for Hypothyroidism. Synthetic hormone pills are prescribed to be taken daily at a consistent time to fill the gap between what the body needs and what it’s able to produce. These medications are sensitive to interference from foods rich in iron, fiber, calcium and other minerals. It is best to take thyroid medication at least 4 hours after eating and 1 hour before eating again. Consider a heart-healthy diet which includes more vegetables, lean protein, and fiber consumption and limiting processed foods, eating out, and intake of added fat and sugar, along with regular exercise to support an overall healthy diet and lifestyle. What foods should we can add or eliminate to help my newborn's eczema and support my wife's ability to nurse? Eczema or atopic dermatitis (AD) in breastfeeding infants may be triggered by allergens in the mother’s diet. However, the evidence to support eliminating suspicious foods from the mom’s diet is contrasted by studies which show no benefit to broad use of this practice. In addition, it is extremely important to ensure adequate nutrition to support the health of both mother and child, as well as milk supply during this period. Therefore, careful consideration should be given before attempting to eliminate valuable nutrient sources from the maternal diet. If foods are eliminated or the mother is unable to meet the increased nutrient and calorie demands of breastfeeding, supplementation may be necessary. Similarly, if milk supply is inadequate to meet the nutrition needs of the infant, supplementation with formula may be necessary. Hydrolyzed formula has been showed to prevent or delay AD in infants. Weight loss back to pre-pregnancy weight is typically a desired health benefit of breastfeeding mothers. If weight loss is occurring too rapidly there may be an underlying nutrition or medical issue that requires further investigation. Do I need to start taking a protein shake or supplement to build muscle? Muscle growth occurs when we have the right nutrients in place, then exercise, then allow time for the body to convert the nutrients into new strong muscle fibers. A common misunderstanding about muscle building is that more protein = more muscle. The truth is that it takes a full complement of nutrients to support the body’s bulking process! Micronutrients like vitamins and minerals support the process by facilitating the new bonds needed to create muscle strands. Carbs act as fuel to support exercise so that more of the protein we eat is used for muscle building rather than burned for energy. Fat is also an important energy source for certain types of exercise and it also contains important nutrients that we can’t get from other food sources. Building lean mass takes the right exercise regimen, a full complement of nutrients in addition to protein, and periods of rest. The muscle building process happens after exercise, not during. Therefore, look at exercise as the way to get to the recovery period where muscle building happens and make sure you’re getting all those nutrients we mentioned to make it happen! Are sugar-free beverages bad for you? Adequate hydration is really important for our health.Water is the best choice for hydration. Water promotes cardiovascular health, supports muscle and joint function, keeps skin soft and pliable, along with many other benefits. Soft drinks like powdered tea and soda can actually dehydrate us since they require the body to use a lot of water to clear the caffeine, dyes, flavor compounds, and acids they contain. So even though the beverage is a liquid it may not actually provide us with much usable water once digested. Are there any types of food/diet or supplements that can help improve my mood? Water: Our mood can swing pretty quickly if we are under-hydrated. Water is a necessary component of a healthy functioning body. Symptoms of under or dehydration can be fatigue, irritability, and unclear thought. Omega 3: Our brains are a vast network of neurons and transmitters which rely on Omega 3 fatty acids to function optimally. It is very important to support our brain tissue with adequate amounts of Omega 3 fats that our bodies cannot produce on its own! Fish, nuts, seeds, and healthy plant based oils are good sources of Omega 3. Vitamin B: There are lots of vitamins that make up the Vitamin B family. Each one may have a unique food source. 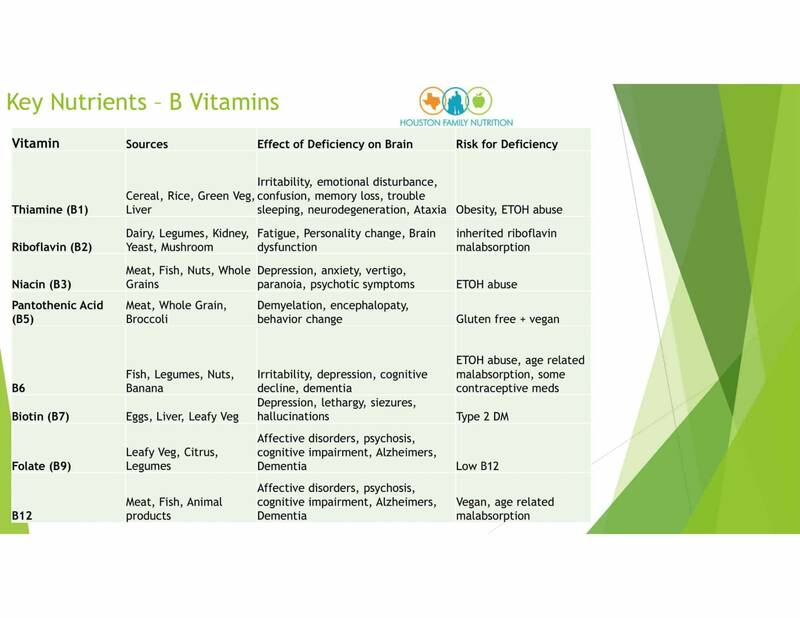 See the chart below for information on each type of vitamin B, food sources, and their specific nutrition impact on brain health. My child is a picky eater, what should I do to help her eat more of a variety of foods? Sometimes it may take introducing a food to a child 6 or 7 times before they ever consider trying it. Be patient. If your child does not want to try a food the first time you introduce it to them or even the fourth, it’s okay. Children’s taste buds turn over much quicker than adults, so don’t get discouraged if they don’t like something the first time they try it. Make sure their attention is on meal-time and not the television, dog, or something else. If your kid loves broccoli but will not touch bell peppers, try sauteeing them together so that at least one food is familiar. Careful though, mixing lots of foods together can make a dish intimidating and confusing, especially for young eaters. Kids love to watch the adults. If you eat green beans in front of your child they will be more likely to at least try a green bean or have a green bean on their plate. If they have not tried sweet potatoes or cauliflower let your child pick which one they eat. Giving them ownership of their food will make it more likely for them to try something new. Kids can try new food without even tasting it! Let kids see, touch smell, and even talk about foods. The more it appears in their world the more likely they are to give it a try. How do I gain weight and muscle the healthy way? When looking to gain weight, you should be eating at 4-6 hour intervals and drinking plenty of water. Your diet should include food from all the food groups to give you the complete array of macro and micronutrients. The right exercise regimen is one that challenges muscles with weights, or at least body weight exercise plus cardio. Exercising on five out of seven days of the week keeps the body in build mode. Finally, rest and recovery is crucial. Make sure you’re feeding your body before, during, and after workouts and getting plenty of rest and sleep. This will allow the body to generate fresh tissue to replace and repair what was challenged during exercise. I heard that you should not have fruit juice. But what if we have it without sugar? All fruit has natural sugar which makes it sweet. When we eat a whole fruit we balance 1 serving of natural sugar with a serving of vitamins, minerals, fiber, water, and beneficial plant compounds. The fruit fills us up to a certain degree. It takes around 4-6 servings of fruit to produce 1 glass of juice. That means we end up consuming 4-6 servings of sugar. It is true that there are also 4-6 servings of vitamins and minerals, but the benefits do not outweigh the overconsumption of sugar. Furthermore, juice does not satisfy hunger because there is little to no solid mass for the body to actively digest.